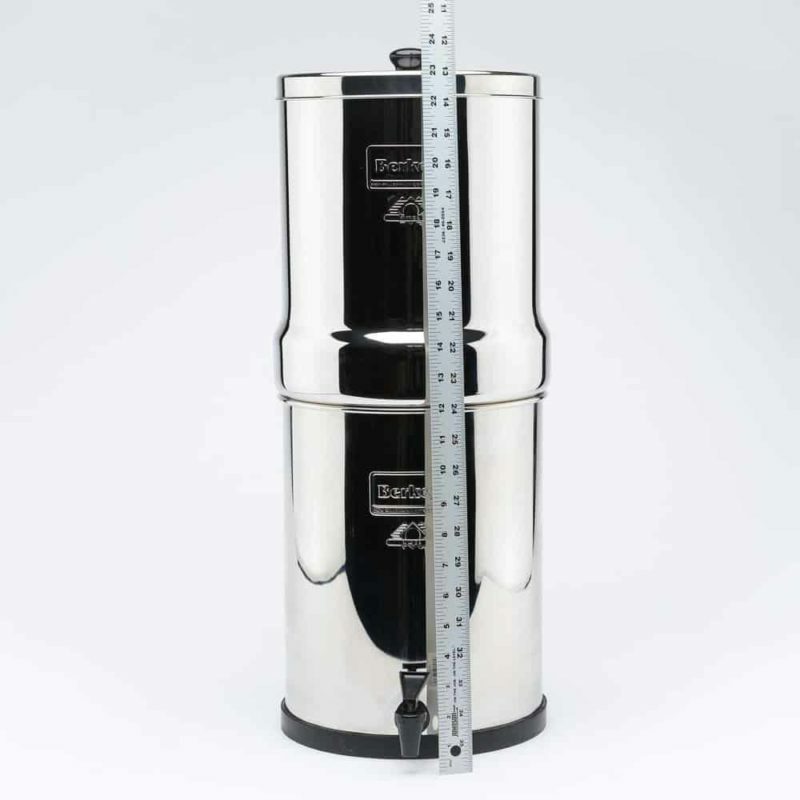 The Royal Berkey water filter is larger in size. 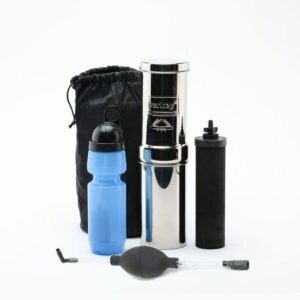 Its larger capacity is more suitable for use at home with large families, travel, outdoor activities or during unexpected emergencies (or for people with high water usage). When it comes to the trusted filtration system, our Berkey systems have been supported by worldwide customers. In fact, the Berkey has become a trusted name in more than 100 countries across the globe. That is actually not at all surprising since Berkey is not only effective in purifying water sources, it is also quite efficient as well. 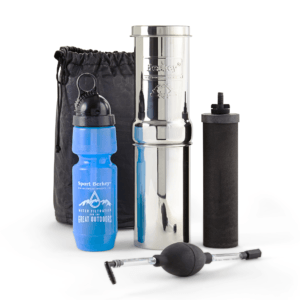 Berkey water filters are usually very versatile products, and they were not only designed for home, but they were also designed to be portable to make it easy for you to bring them along on your outdoor adventures. The Berkey systems also do not require any special equipment or electricity to make them work, and it is just pure gravity, they can also purify not only treated water but also untreated raw ones from the lakes and other natural sources. If you need a water filter system for your home that could cater to your whole family, then the Royal Berkey is a good choice. This filter system is a bit bigger than the Big Berkey since it was designed to be a step up the size. This water filter system is actually the result of a lot of customer feedbacks saying that Big Berkey cannot really keep up with the water demands of their family because although they are just a family with a normal size, their water consumption and demands were higher than normal because of a unique lifestyle. We have listened to what our customers have to, and we found out that this group does not only use water for drinking but also for other things like cooking, plants and their pets. People in this household could also have an active lifestyle that requires them to consume more water than the normal. 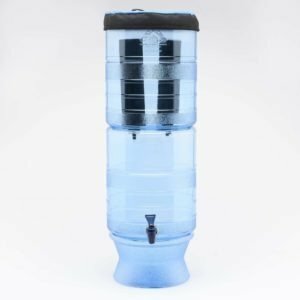 People in this group needed a Berkey filter that could offer a much larger capacity, and so the Royal Berkey Water Filter was made. Like all other Berkey Water Filter system, the Royal Berkey can remove 99.99 percent of water contaminants. 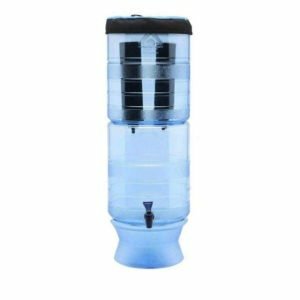 It can filter out harmful bacteria, cysts, harmful mineral, organic solvents, harmful chemicals and parasites in your drinking water. 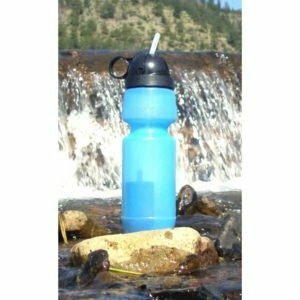 Although this is a very powerful water purifier, it still leaves the entire healthy mineral in the water that we are going to need. It’s storage capacity s 12.3 liters or 3.25 gallons, and the purification elements can also be expanded to four so that it could purify up to 30.3 liters or 8 gallons of water in an hour. 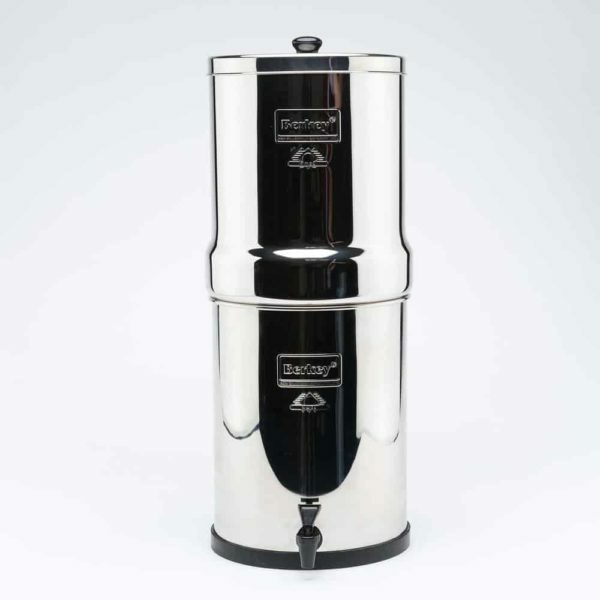 The Royal Berkey water filtration system is ideal for larger families and people leading an active lifestyle with more demands for clean and healthy drinking water. YES> If you care about what your family is drinking, invest in this filter. Took gross heavily chlorinated city water that turned brown from a drought into great clean water just like we bought it in a bottle. Thanks to this waterfilter I don’t have to buy any water bottles anymore and have less trash. 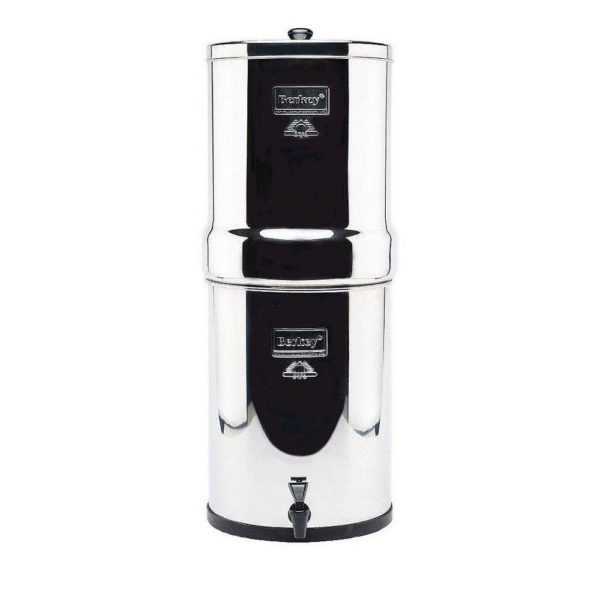 The water filter itself is super just make sure you follow the instructions which comes with to per rinse/soak the filters…very important…at all very good quality….the only thing is it would be nice to have a metal faucet for this price included. Expensive. But worth it. We own 2, and purchased this one for our son’s wedding. It was a gift. The box, however, the Berkey Box was very old, weathered, and had been entered into and taped back. The original tape was yellow and was so old, it had no more adhesive. This outer boxing looked awful and we had to go out of out of our way to go find a nice box to put it in to wrap up. That is my only complaint. The actual Berkey was brand new inside. It’s just a shame this seller sent it to me in a really old box. Buyer beware – and we will probably never return to this seller again. *When you drop a few hundred dollars on a NEW product, you should expect it to be in a nicer box. Overall, very sleek look and simple. I love everything it filters and the amount of things it filters, that’s the only reason I continue to use it. It’s a lot of daily work to get there though. Because it’s not hooked up to a water line, you have to fill it manually. For me and my family, we go through at least 3 gallons a day ( which is the max capacity) so I’m refilling it at least one time a day. And so that’s a few trips back and forth from the container to the sink, filling it. I honestly don’t mind it, like I said I’ll do it for the Good water. My only complaint is the way the the filter and then it that holds it in, the way it’s constructed. You have to have a right fit with the filters and the container or else unfiltered water will get through, contaminating the already filtered water. One of wing nuts is poorly constructed and comes loose a lot, causing water to seep through. I’m going to see if the company will help with this, I’ll update my review based on what I find. We only drink our water from this. The water tastes great and it gets rid of the chlorine taste in water. We have a family of 6 and we are so so glad we got the Royal (3 gallons). It lasts us usually about a day and a half or less. The hard thing is charging the filters for it, but once you do that you don’t have to do it again as long as you keep using it. We only use it with 2 filters and it seems to do the job efficiently enough. I do recommend the sight tube to see how much water is left. Also the lever can be left engaged for easy filling of a bigger bottle. We have emptied the Berkey into our water bottles and forgotten to disengage the lever, then filled the top and as it came through the filter slowly we had a little flood. So be cautious of that. Received item well packed. Inspected item and all appeared in good order. Used the Big Berkey water filter system for almost 2 months and it developed a pinhole leak in the upper chamber which leaked unfiltered water into the catch basin. Very disappointed with a product with such good reviews. Unable to purchase a replacement part nor am I able to return the item. Extremely disappointed. Was happy with the product up to this point. Amzing product, looks nice, big, but looks clean and modern and we will have cleaner water! Worth all the money for the health of your family-we are a family of 4. The first water I like to drink at room temp. Good and good for you! This product is just fantastic and the seller is even more fantastic. I apparently had gotten a defective black filter(s) and immediately contacted the seller. He could not have been more understanding and took rapid action to ship me new filters. I love this way to get fabulous and safe water at my finger tips. The filters last a long time and in a short time of not having to buy bottled water, I am getting my investment returned. I also feel so much better that I am not using all those plastic bottle to pollute the environment. I fill my stainless steel bottles in the morning and I am now getting the right hydration (half my body weight in ounces every day) for my body because the water tastes great. I did order the spigot with the water indicator and it was a necessity so you can see how full the water container on the bottom is without picking up the top tank. I recommend doing the red dye test when you set up your Berkey to be sure the filers are working properly. There are 2 water drinkers plus 2 pets in our family and the Royal is the right size for us. Healthiest water! Filters water without any weird after taste. Awesome for those who don’t want all those chemicals tap water contains. Wish I ordered this long time ago. Water tastes so good! 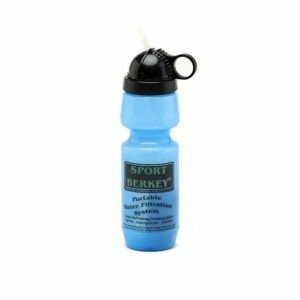 A Berkey water filters do not contain bpa. As for filtering out bpa I would contact them direct. We ate 100% satisfied with our berkey and recommend the product highly. Q Can the black filters be used with a 12 year old Big Berkey. I have only used ceramic candles to date. 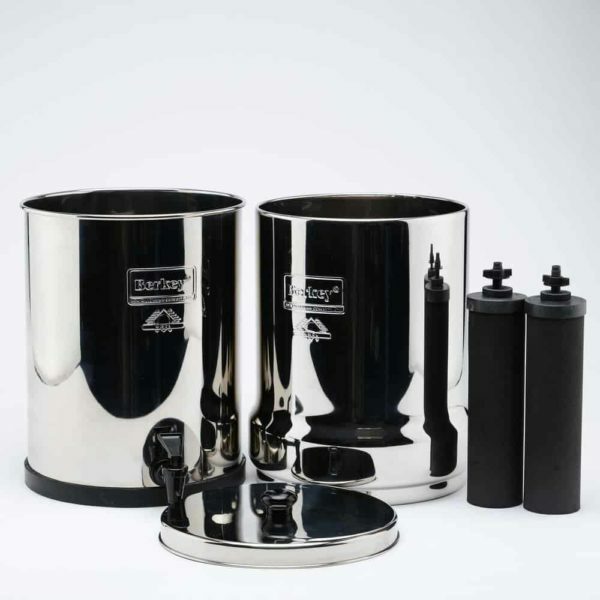 A I would think that you could use the black filters since the design has been the same on the container for as long as I have known about Berkey. I would recommend that you double check with Berkey to confirm though. Q Do you have this on stock and how long would it take to get it to Indiana? Q Does it remove uranium in well water? A Thanks for your question, currently no testing has been done for uranium/plutonium, but testing has been done for radon 222. It depends on the situation and what is known to have happened, as most water sources should not have those contaminants. If the water source is known to have those contaminants except radon 222, other sources of water will need to be found. Q Since the water produced is so pure, can it be used in place of distilled water in such units as humidifiers, irons and cpap machines? A While it will be pure, it will still have minerals in it. You will need to use a distiller to remove all the minerals. Q Are there benefits to the stainless one over the plastic Berkeys? A Fluoride/Arsenic filters can be added to the two Black Berkey filters for this unit. They would have to be purchased separately. For effectiveness you can read the test reports on Berkeys website berkeywater.com. Q Can this support a 3 gallon or 5 gallon jug (approx. 25-43lbs) on top with the lid off to reduce having to refill as often? A We do not recommend doing this. The system was not designed for it. Q Does the system remove fluoride and chlorine? A Chlorine Yes, Fluoride you will need the PF-2 filters, which we sell on amazon. Q does this royal unit have the viewer on the side to be able to tell how much water is in the lower chamber? A You have to buy the spigot with sight tube! All worth it. Best water I have ever had! Q Does this filter remove arsenic? A This kit will only come with two black filters. You'll need to add the Berkey Flouride Filter PF-2 to remove flouride and arsenic. Q Would it work to purify rainwater that had already been filtered through a collection barrel with canvas, pebbles, and charcoal? A Yes. It will also filter the rainwater without all of that other stuff. 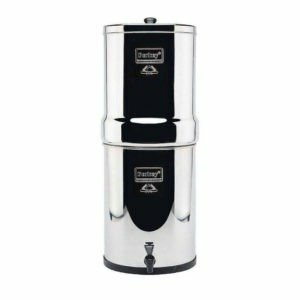 Q Considering buying Berkey Royal system. Which is better-ceramic or black filters? Q Are there any plastic parts that come in contact with water? Q How many gallons will this purify prior to requiring new filters? A It would depend on the water you filter. I've been using it for one year for two people and still the original filter. Q Does this remove most dissolved pharmaceutical chemicals? Q Can I use also the white fluoride filters plus the 2 included black filters? A Yes, the white fluoride filters attaches (very easily) to the black filters and hang underneath the tank. Q I bought this two years ago and haven't used it yet. Do I need to buy filters for it? A There should have been a couple of filters with it? They should be fine to use. I know the black ones last up for 10 years, you just have to prime the filters which takes less then 5 minutes. I am not sure about the white ones, but there should be instructions with the filters. If you didn't get any filters, then yes, you would have to purchase at least two. We have two of the black ones because we wanted them to last longer. I am not sure what the length of time is for the white ones but the black ones also are suppose to filter more stuff. We have a lot iron/rust in our well water and the black ones work great. We just have to clean the unit about every 3 months, especially the top part as the orange junk accumulates. The reservoir part (bottom) stays pretty clean. Hope this helps. A I don't know exactly what you mean. It will filter any water. It does not require any particular brine or solution to do it's job. Q Can this be shipped to California? A Approved Berkey Dealers are prohibited from selling Big, Royal, Crown, and Imperial Berkeys in CA at this time. Q Does this unit remove chlorine? A You have to get the chlorine filter. It is white and can be used with the carbon filters that come with this unit. Q Does it alkalize water ? A It filters out impurities. If your water goes through alkaline it will come out as such. Q What is the micron rating on the filters? which elements do i need for maximum flouride filteration/reduction, pf-2 or pf-4? A The company that manufactures the Berkey filters does not publish a micron rating due to confusion and variance in the standards used to determine micron ratings. An absolute pathogenic bacteria removal rate is a better gauge because it is far more difficult to abuse. Based on that criterion, the Black Berkey filters remove greater than 99.9999999% of pathogenic bacteria such as E.Coli. To our knowledge, no other personal filtration element can match that capability. 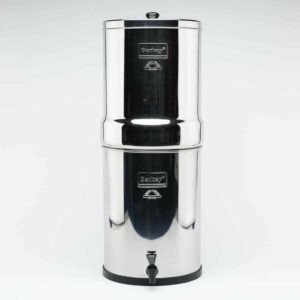 If you're ordering the Berkey system with Black Berkey purifiers, you will need the PF-2 fluoride filters, which are made specifically to work in conjunction with the Black Berkey purifiers. The PF-4 fluoride filters are made to be paired with the ceramic filters. Q Is this filter all assembled with the filters already in place? A No, the system comes with assembly instructions for setting up your Berkey. There are also multiple videos on Youtube to help with the visuals. A Yes, I believe it did. A Would love to help, but I haven't tried the Adya Clarity product yet. However, I LOVE my Berkey & would not part w/ it. I don't think you'd need to filter treated water, though, if AC works as well as they say it does. Q Does this already include the two black filters inside or this is just the unit? A This includes the 2 filters. Q Does this filter be suited for daily use for tap water treatment ? as I read a review it is just for emergencies and trips. A I use it everyday....It sits on my kitchen counter. I LOVE my Berkey, if anything ever happened to it I would immediately buy another. Q Have any of you buyers ever tested your filtered well water professionally, to see just how pure your water is? How else would you really know? A We do not use well water we use city water. We have never had the water tested. When setting up the Berkey, the instructions have you add red food coloring to the water to test whether or not the system was properly set up and is filtering the water as it should. After assembling the Berkey the "red" water came out completely clear. Also, water from the tap has an odor, not bad necessarily, that the Berkey water does not have. That's all the "testing" we've done. The water tastes great and we're very pleased with our purchase. Q Will this remove iron rust from the water? Q Does it remove plastic particles? Q Exactly how long (months? years?) does the two black filters last with daily average use? A They last up to 6000 gallons per set of 2, or at least 2 to 3 years of usage. It can be longer, but depends on daily usage amounts. Q Can this model hold the 2 fluoride white filters? A Yes... it has 4 available slots to hold filters. You can use 1 or all four if you so chose... to include the fluoride filters. I currently use 2 regular and one fluoride. Q Can this make the water more alkaline? Q Has anyone purchased this to prevent kidney stones, and does it help? A The filters are made in the USA. A This is a purifier that keeps in the healthy minerals. Q does it remove fluoride? A Yes, and a lot more. Go to www.BerkeyFilters.com for answers to all your questions. 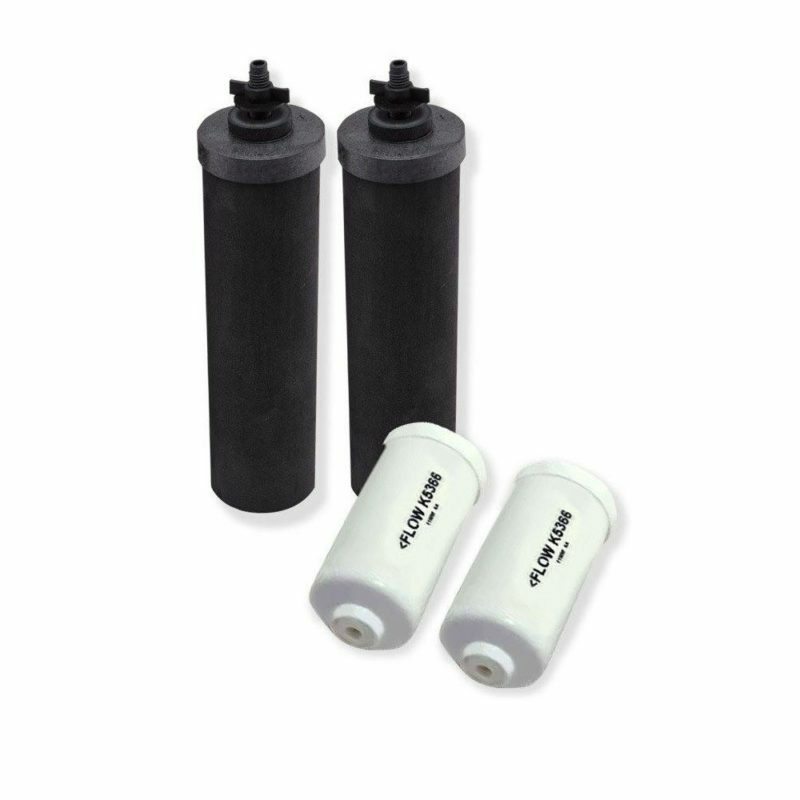 We have had our system for years now, have replaced the PF-2 (fluoride & other contaminants) twice now, but the black filters can last a very long time - just need to be cleaned periodically with a 3-M pad. It's the best system on the market, least expensive to purchase and least expensive to operate, and can be used outside (camping, emergency water needs, etc.). Nothing better available; we very highly recommend it.